Jesus said to the man, "Be of good cheer, for your sins are forgiven. Take up your bed and return to your own house." HEREVER JESUS WENT, crowds followed him. In the streets, or even in the homes of Capernaum, many people gathered when they knew he was present. Some of these people were his friends, others were merely persons curious to hear him speak and to see him perform some miracle, while still others followed for the purpose of finding fault with him. One day while Jesus was in Capernaum so many people came to the house where he was staying that they left no room for others to enter. Among them, as usual, were his disciples and friends, the curiosity-seekers, and the fault-finders. These fault-finders were scribes and Pharisees who had come from far-off places to hear him. They had heard many reports about his wonderful teachings, and they wished to hear him for themselves. As he talked, they sat near by, watching every move he made. Into that crowded room sick people had been brought, and Jesus healed them all. Then while he preached about the kingdom of God the listeners were surprised to hear a scrambling overhead. Presently the roof began to part, and the people saw a queer-looking object being lowered from the ceiling. Then they recognized the form of a crippled man lying on a bed. On the roof were the four friends of this crippled man. They had tried to bring him to Jesus; but when they carried him as far as the door they saw that it would not be possible to push with their burden through the crowd. Yet they were determined to bring this suffering man to the great Healer. The man was not able to move himself about, and day after day he had lain upon his bed because of the disease that had made him so weak and helpless. When the crowd had refused to make way for them to pass, the four friends carried the man up on the flat roof of the house. Then they tore up the roof tiling and saw where Jesus stood. This done, they tied ropes about the bed on which the man lay, and lowered the bed very carefully into the room, before Jesus. 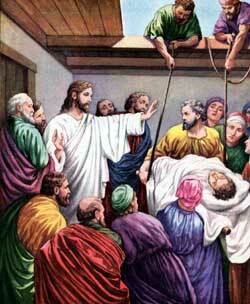 Of course the service was interrupted when the sick man was being lowered by the ropes from the roof. The onlookers wondered what Jesus would do. Perhaps some of them knew this sick man. They were all surprised when they heard Jesus say to him, "Son, be of good cheer, for your sins are forgiven." The look of pain left the sick man's face and a happy smile came instead. But the astonished people were not watching him. They were looking in surprise at the one who had dared to say, "Your sins are forgiven." They knew God had power to forgive sins, but they did not know that Jesus was the Son of God. The fault-finders began to say in their hearts, "Who is this who pretends to forgive sins?" None except God can do that! Jesus knew their thoughts, and he said, "Why do you think evil of me in your hearts? Is it easier to tell the man that his sins are forgiven, or to tell him to rise up from his bed and walk? That you may know I have power on earth to forgive sins too [then Jesus turned to the helpless man lying on the couch before him and said], Arise, take up your bed and return to your own house." Immediately the stiffness departed from the sick man's limbs and strength came into his body. Then he arose up in the presence of all the people, rolled up the couch, or mat, upon which he had lain for many days, and lifted it up on his shoulders just as well men carried their beds in that country. The surprised people made way for him, and he walked out through their midst into the street to join his happy friends. Great fear came upon the people in that crowded house. They glorified God, and said to each other as they hurried home, "Surely we have seen strange things today!"